Comprehensive 2D-LC is a new analytical methodology combining two independent separation modes orthogonally, greatly increasing separation efficiency. The combination of different modes enables the separation of peaks that are difficult to separate using conventional LC, providing excellent results for the analysis of complex sample matrices. Unlike other conventional two-dimensional techniques the Nexera-e provides complete separation as a result of the combination of orthogonal 1st and 2nd dimensions. Comprehensive 2D-LC fully utilizes both separation systems to achieve the ultimate separation power. Insufficient peak separation may be observed for complicated samples. The peaks separated by the 1st-dimensional system will be isolated by the 2nd-dimensional system. Comprehensive 2D-LC fractionates the 1st-dimensional eluent and successively separates the fraction on-line with the 2nd-dimensional system. 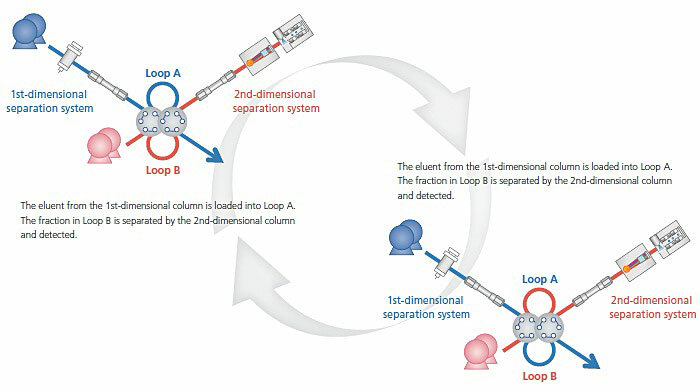 Therefore, the 1st-dimensional system intersects with the 2nd-dimensional system at the dual valves and dual-loops. With valve switching, these loops continue the fractionation of the eluent from the 1stdimensional system and the injection of the fraction to the 2nd-dimensional system alternately. Analysis of samples on a two-dimensional map On a two-dimensional map, since each one-dimensional axis and two-dimensional axis are set according to different separation conditions, the physical properties of compounds and their position on a map correlate. By grouping a compound with a similar structure, it is possible to match each compound group visually or to analyze the physical properties of an unknown compound. Each phosphatide compound is separated based on its polar group (class) in a normal one-dimensional phase separation. And it is separated according to the chain length of fatty acids by a two-dimensional reverse phase analysis. Each compound is grouped for each class and showed in the above figures. Although some components are strongly detected in the positive mode and others in the negative mode, it is possible to acquire both data in one analysis utilizing the Ultra-Fast Polarity Switching [UFswitching] of the LCMS-8050 LC/MS/MS.